In the Horizon tab of the Control Panel, click the Eraser button to the right of the horizon name. Click and drag in section or map views to erase points from the horizon. In the Horizon tab of the Control Panel, select the horizon. In the details panel, expand the Eraser section. In the Map View / Operations tab, select Erase. Choose the horizon to erase in the navigation bar. Note: Ensure the horizon to be erased is selected in the navigation bar. Use the Undo or Redo buttons to remove or re-apply any changes to a horizon. This includes major updates, such as smoothing the entire surface, or small edits such as repicking or erasing. See Horizon Undo and Redo for more details. 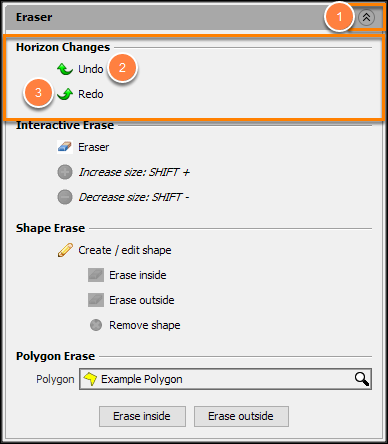 In the Horizon tab, open the horizon’s Details Panel and expand the Eraser section. Click Undo to cancel editing change. Click Redo to redo canceled change. 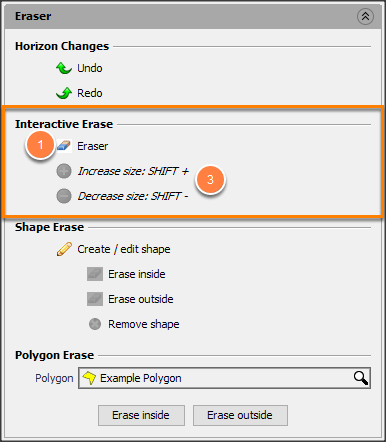 Use the interactive eraser by entering erase mode, then clicking and dragging in section and map views. Start Erase mode, by clicking the eraser icon. Begin erasing by clicking and holding the left mouse button, then dragging over the horizon. In Map View, the area under the cursor is erased. In sections (2D, IL/CL, Arbline, Gather) the horizon erases the entire vertical section. Adjust the size of the eraser while in Erase mode. Click (+) or (-) buttons. In the 3D View or Map View, press SHIFT and +/-. Click the eraser icon or press Esc to stop erasing. Use Shape Erase to pick an area in the Map View and erase inside or outside the selection. 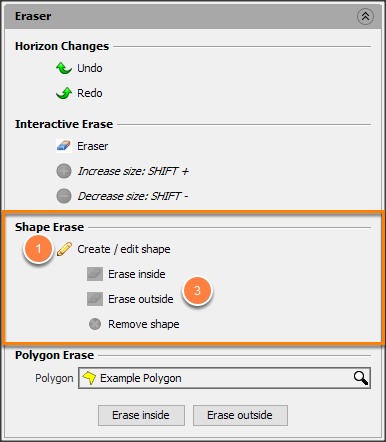 In the Shape Erase section, click the Create/edit shape pencil icon. Click the left mouse button in the Map, to place points defining an area. Finish defining the area by double-clicking OR clicking the pencil OR pressing the ESC button. 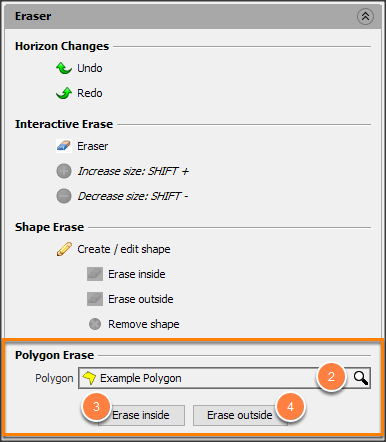 Use Polygon Erase to erase the horizon inside or outside an existing polygon. Only enabled map polygons are listed.